Eurocopter delivery of four upgraded helicopters Tigre for deployment in Afghanistan. The Afghanistan Stabilization German Army Rapid Deployment (ASGARD) program of modifications for the Tiger Support Helicopter was agreed by Eurocopter and the Federal Ministry of Defence at the end of 2011 and includes a sand filter, additional defense weaponry, a mission data recorder and enhanced communications equipment for multinational missions. “The Tiger presents the Bundeswehr with an unquestionably modern machine for its operations, with the ASGARD configuration ideally tailored to Afghanistan. However, it is equally true to say that in the long term this helicopter will do its duty in a whole range of possible combat scenarios,” explains Eurocopter President & CEO Dr. Lutz Bertling. Since last July, a total of four aircraft newly configured for Afghanistan have been delivered to 36 Combat Helicopter Regiment in Fritzlar, which allowed preparations for deployment from the end of 2012 to start in good time. The second batch of a further four helicopters is due to be delivered from December onwards, as agreed with the Bundeswehr. 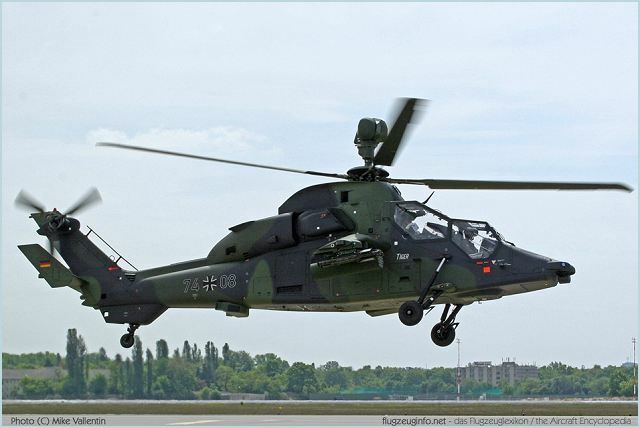 To date, Eurocopter has delivered 93 Tigers in all, including 27 UHTs to the Bundeswehr. Altogether, the helicopters in Germany, France, Spain and Australia have logged over 38,350 flight hours, while the Tigers of the French Armed Forces alone have seen over 3,750 hours of service in Afghanistan, and 250 in Libya.